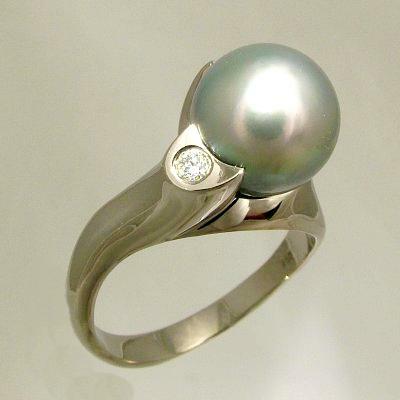 ELEGANT, FREE FLOWING 18K SOLID WHITE GOLD RING ENHANCED WITH A SILVER SOUTH SEA ROUND PEARL AND A BRILLIANT CUT DIAMOND. THE PEARL HAS AN EXCELLENT LUSTRE WITH A DARK SILVER COLOUR AND AN INTRIGUING PEACOCK HUE. THESE COLOUR TONES BLEND IN BEAUTIFULLY WITH THE WHITENESS OF THE WHITE GOLD. FOR LOVERS OF FINE HANDMADE JEWELLERY AND SOUTH SEA PEARLS, WHO PREFER THE APPEARANCE OF THE WHITE GOLD, THIS COMFORTABLE TO WEAR ELEGANT RING, IS GENUINE STYLE-n-QUALITY AND A VERY ATTRACTIVE INVESTMENT IN A WORK OF ART. PLEASE NOTE THAT THE CIRCULAR HUES ON THE PEARL ARE NOT COLOURS AS SUCH, BUT SIMPLY THE REFLECTIONS OF THE LIGHTS AND THE LENS OF THE BLACK CAMERA ON THE SURFACE OF THE PEARL!